Picture a nice summer day with a slight breeze and you think to yourself "I would really like to sit outside and enjoy this wonderful weather." 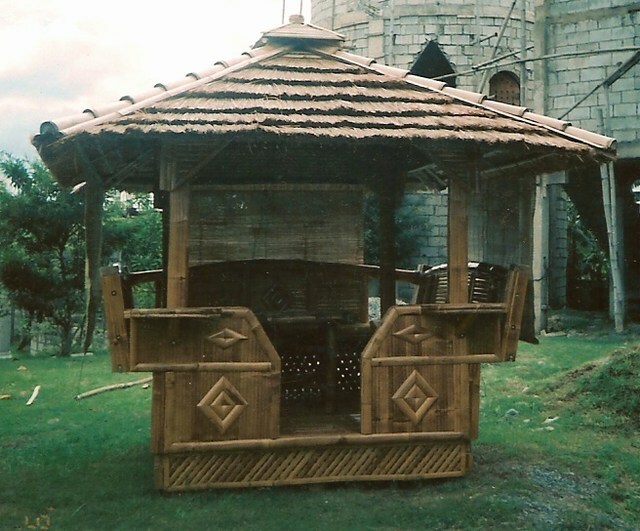 Now you can make that dream a reality with our Bamboo Gazebos! As always, these are hand carved natural outdoor wood/bamboo fixtures and furniture, some natural wood markings my appear on the items. There may be a slight variance in wood color(s), paintings, shading and/or appearance, which do not take away from the image shown on this site unless otherwise stated. Product images are for reference and demonstration only. Proper care and maintenance is required to keep items from fading or discoloration. We suggest a small coat of a clear spray lacquer for the bamboo products and a small application of clear wood stain for the tiki products. This will protect the bamboo/wood products from outdoor conditions and bring the out the natural beauty of your items "back to life"
These items ship by a Common Carrier Trucking Service.